Heather and I arrived by ferry in Dublin on the Tuesday before the race and checked into our excellent bike friendly B&B in Dun Laoghaire. Most people were staying in Dublin but we reckoned it was best to be within walking distance of the bike and swim start. We drove up to Belfast on the Wednesday to visit a few of the “ancients” still living in my Northern Ireland birthplace. Thursday; registration and sorting out all those red, white and blue flags, I mean bags, in their correct locations in the split transitions. The swim/bike transition was in Dun Laoghaire and the bike/run transition in Phoenix Park 10 miles away. Friday; visit to the osteopath to try and get my shoulder into a state which might enable me to get to the finish line. The course seemed to go on for ever – I made the turn for the finish too early and had to correct. Water conditions were excellent with little chop and the added support of all that salt. Bike: The gentle jog to the bike warned me of the shoulder pain to come. I was using a titanium road bike rather than the carbon TT bike so that I could see down the road without having to lift my head. The level of pain was almost unbearable during the jog to the bike and I had to take the edge off it with a couple of co-codamol. 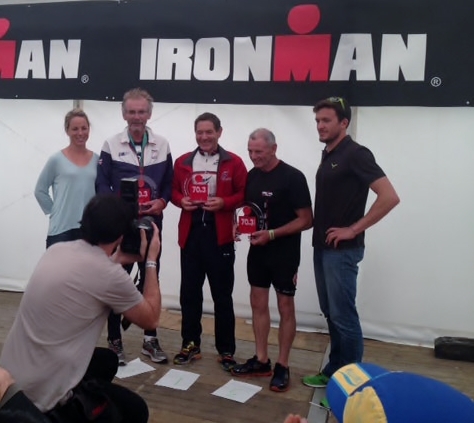 The course was brilliant – good surfaces in the main and great support the whole way round. I couldn't take fluids or food on the move and had to stop at the stations. Run: Three laps of Phoenix Park – flat as a pancake with brilliant support – they gave us a wristband at the end of each lap – I heard someone offering the official Eu1000 for an extra band! I used a spare tube to try and improvise a sling for my arm and then chucked it as useless. I have to confess that the only time the pain in my neck and shoulder faded was on the last lap of the run when I saw Michael Mallon in my AG, Heather said he was about 5 mins ahead – I started racing then and the extra pain of the effort seemed to numb the shoulder. Maybe I can't help it – I'm just a racer! I did catch him too. Came up on the tracker in 1st place in AG, downgraded to 2nd – awarded trophy for 2nd but times for 2nd and 3rd were the same. Only 3 finishers in the 65+ AGs. Finished the race in 6hrs 34mins 50 secs - ranked 5th in UK and 104th in the world the 65/69 AG. I have unfinished business with 70.3 – roll on Staffs 16th June 2016. I can guarantee now that I will NEVER enter a long distance Ironman 140.6 race. We completed our trip by visiting some old friends in County Wicklow and enjoyed a great day catching up with places and people I hadn't seen for nearly 50 years. This was a real challenge for me - the hardest ever in my lifetime - but nothing compared with those women and their families whose pathway out of serious perinatal mental illness is a huge struggle. Although the race was literally “a pain in the neck” it was the sponsorship for APP that kept me going - once again a great big thanks to APP and all my sponsors.